Waze is crowdsourcing, analyzing, and disseminating traffic information to improve driving experiences for its users. 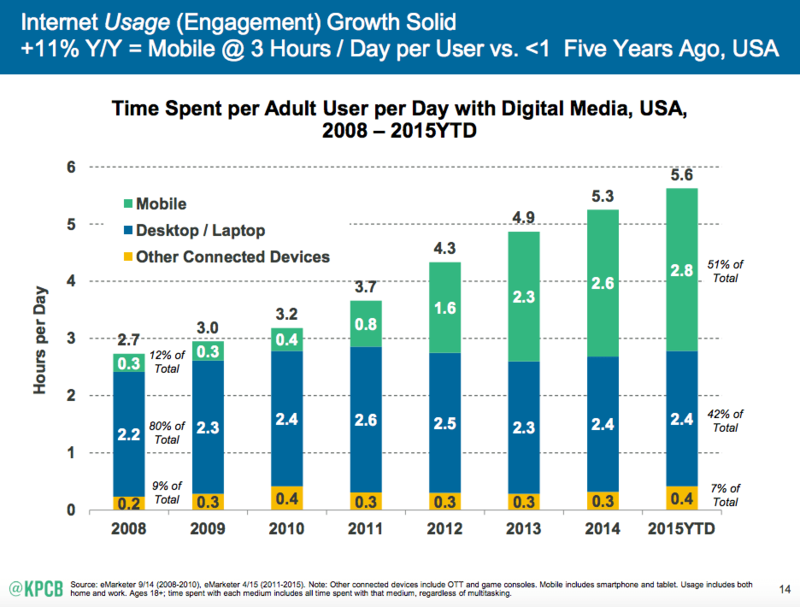 Mobile devices have reached a tipping point as both the number of users and total usage (time spent per day) now significantly outpace other forms of digital connectivity (desktop/laptop/other). 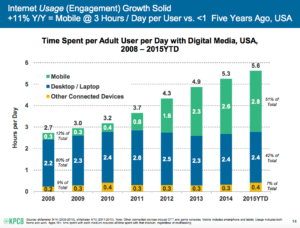 There are over 2.1 billion smartphone users globally. Over two thirds of adults in advanced economies report owning a smartphone. 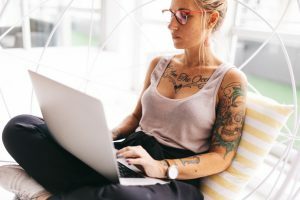 An increasingly connected and on-the-go world has created a tremendous opening for companies able to effectively reach this audience. It has also provided an opportunity for companies to capitalize on other technological megatrends such as artificial intelligence and big data as well as the sharing economy and distributed trust to collaborate with people in order to solve everyday problems. Road-traffic is one of those of problems. It is universal and indisputable that people loath wasting time in the car. Enter Waze (owned by Google)! Waze seeks to solve this problem by creating local driving communities that work together to improve the quality of everyone’s driving. It is effectively a GPS system on steroids. Instead of passively providing route guidance assuming traffic conditions are static, Waze differentiates itself by using live feedback produced by its users to generate real-time traffic reports. It then adjusts its route guidance accordingly and communicates the changes to users. 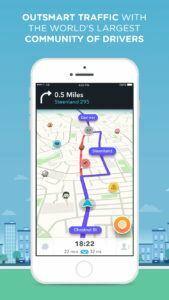 By crowdsourcing, analyzing, and disseminating pertinent information instantaneously and iteratively, Waze seeks to improve everyone’s travel experiences. The user experience is simple and requires little, if any, change of behavior on the part of consumers. Users download the app, enter their destination, and then follow the turn-by-turn navigation curated by Waze. 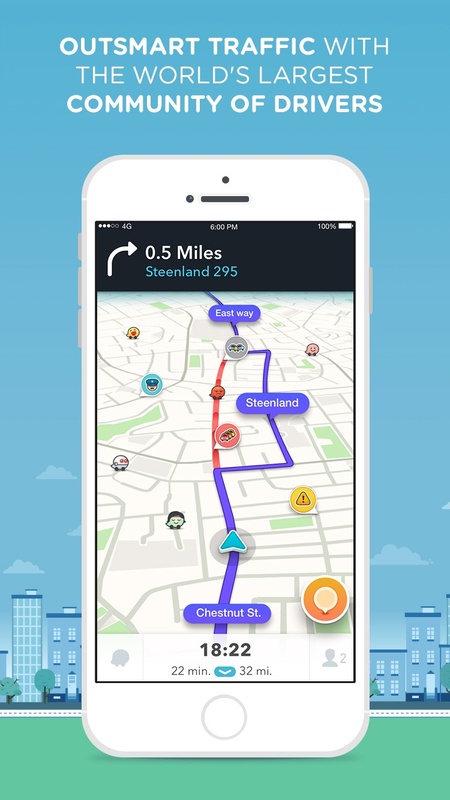 Waze automatically updates its route guidance based on changing traffic conditions. At the same time, the user is passively sharing his/her traffic and road data with other Waze users on the road. Users also have the option of taking a more active role by reporting additional traffic information or hazards along their routes, or acting as online cartographers helping Waze to build out and refine its own maps over time. The value creation for consumers comes in many forms: shorter transit times, decreased gas consumption, accident prevention, a playful app interface, and the ability to send live updates to friends with Waze’s social features. The app is also free! Since its founding in 2007, Waze has grown at a rapid pace and boasted of over 50 million users in 2013. All of these users means Waze has collected and continues to accumulate a wealth of data that can be used to generate significant value for the company. More specifically, Waze captures the commuting habits of tens of millions of users—when they drive, what they pass by on their way, and the location they ultimately travel to—and uses that data to sell location-based advertising to advertisers. Consider the ability for a restaurant to alert users when a consumer is near a restaurant’s location. That proposition is far more valuable to advertisers than showing the same ad on a website when a potential customer is instead sitting at home. 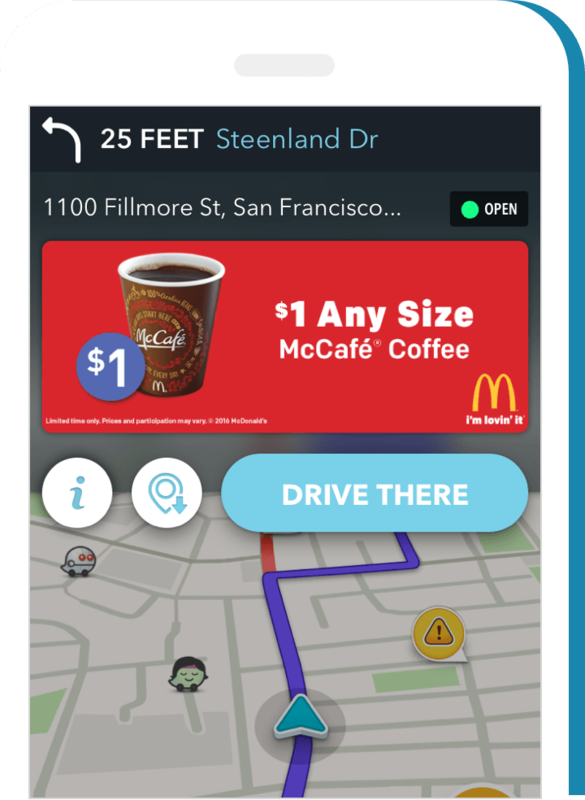 Advertisers are hungry for more information on their consumers, specifically the user’s location, and Waze gives them a platform through which to target consumers more effectively. For Waze, the network effects are critical to the ecosystem. From the driver perspective, the information and analysis is only as good as the incoming data from its users. If there aren’t enough users of the platform, the data is less accurate and less useful, and the value and differentiation of the entire platform is minimized. Similarly, Waze relies on the network effects to create value for and subsequently capture value from advertisers. The more consumers using the app, the more valuable the data, and the more leverageable the customer base is to advertisers. Less tangible, but still relevant, are the benefits consumers may derive from more advertisers targeting them more effectively. Tread carefully with advertising – there is inevitably a change to the consumer experience when companies introduce advertisements. Part of Waze’s attractiveness to consumers to date has been its simplicity, minimalism, and its friendly and “gamey” interface. 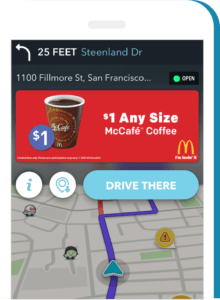 Waze must be thoughtful about integrating advertisements into this model as to not disengage consumers and damage the powerful network effects on which the company relies. Car insurance – with its technology, Waze likely can track driver behavior, which is of great use to car insurance companies. Armed with more data on driver behavior, car insurance companies can more accurately price premiums (perhaps offering discounts to consumers), better retain customers (through cheaper premiums), and incentivize better driving (through the prospect of cheaper premiums). Waze should look at this channel for monetization. As a former resident of Southern California, Waze is like a close friend to me. The one point I would question in this post is that Waze creates value for customers via accident prevention. Car crashes in LA (and across the country) are on the rise, and while increased driving due to an improving economy and lower gas prices certainly shares some responsibility, distracted driving is also a major player. I think Waze absolutely has good intentions, but even voice commands take driver attention away from the road. Additional steps like reporting accidents and police cars distract even further. Although Waze is intended to only be manually operated by the passenger, in reality plenty of drivers find themselves playing this role. I wonder as cars get smarter if Waze can somehow come up with solutions like connecting to the car to know if a passenger is present in order to promote safety? I think you make a great point about the delicate balance between monetization and the customer experience given the importance that network effects have on Waze’s model. It is interesting to me that Google owns Waze as well as probably one of its biggest competitors, Google’s own maps platform. It makes sense to push the envelope and figure out the right amount of advertisements consumers will deal with before switching as this targeting advertising is far more effective and valuable than traditional billboards, as you mentioned. Looking into car insurance is a very interesting idea, although similar to the Digital World case, it could cause an inefficient market for those who opt not to use the app due to privacy or other concerns with their own driving ability. Great post! There definitely are tremendous opportunities for apps like Waze to improve a host of driving conditions be it safety, timeliness, fuel economy, etc. as you have identified in your post. I agree that advertisements may be a slippery slope which could damage users’ experiences to the point where the app falls out of favor. One question I have is regarding the risk major smartphone navigation providers like google/apple maps pose to Waze. What is to stop one of those major players from implementing Waze-like features into their apps and immediately taking the market out from underneath Waze? Do you know if Waze’s features are at least patent protected? I really enjoyed reading your blog post and thoroughly appreciate the punny title. I agree with Nicole about the safety issue Waze presents and wonder if there are alternative ways for the app to assess traffic. Could a phone’s camera be used to visually identify police activity instead of relying on the driver/passenger to enter the data? In addition, I think one of Waze’s biggest opportunities is around the data is collects. You allude to this in your point about car insurance, but I think the data possibilities are much broader than the ones you mention. For example, the City of Boston has partnered with Waze to address a variety of public safety issues. Can other cities follow suit? How can large tech companies leverage network efforts to have a positive social impact? Should tech companies even be doing this? Is it wise for their bottom line? 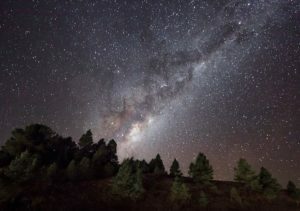 What a well-written and thought provoking post! I agree Waze has some great features and clearly has a loyal following (i.e., more than 50 million users), but I believe there are some serious concerns regarding the potential safety of using the app while driving, which can pose a threat to the usage of the app as-is. The Department of Transportation, for example, warns that using the app can be “just as dangerous as texting and driving.” Furthermore, as described by the AAA Foundation for Traffic Safety, quickly glancing down at the Waze app can affect one’s reaction time for the next 27 seconds. Usage of the app, therefore, begs the question as to whether a police officer can issue a tickets to – as described above – “active users” and, if these users truly pose a threat to others on the road. Right now this is a grey area, and there are really no regulations against apps such as Waze; how do you think Waze should address any potential safety concerns and future regulation? What proactive initiatives should drivers and users of the app be encouraged to take?